"My Greek grandma's recipe made vegetarian. 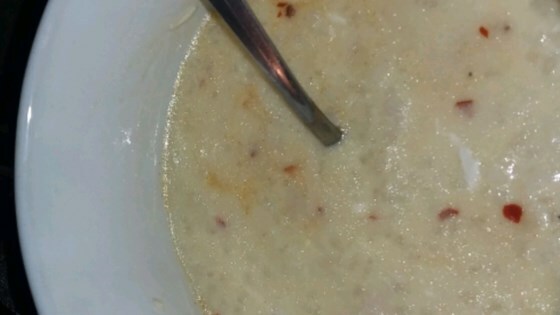 This was the soup that she made me whenever I was sick, instead of chicken noodle soup. It's rich, creamy, and soothing!" Bring vegetable broth to a boil in a 2-quart saucepan. Reduce heat to medium-low, add rice, cover the saucepan, and simmer until rice is tender, about 20 minutes. Beat eggs and lemon juice together in a small bowl. Ladle some of the hot soup into the egg mixture and stir to temper the eggs. Stir egg mixture into the broth and rice. Reduce heat to low and cook until the soup is hot, about 5 minutes. Season with salt and pepper. For a thicker soup, add some flour or cornstarch while cooking. this is one of my all time favorites. I kick it up a notch by adding a dash of paprika and a sprinkling of crushed red peppers. I added chicken to my bowl but not the whole pot.